Table tennis is a popular sport played using a table, hard paddles, and celluloid or plastic balls. Table tennis is an Olympic sport, and many people consider it identical to ping pong outside of the level of competitiveness. However, in recent years, the rules between ping pong and table tennis are diverging more and more. Ping pong is the trademarked name of a table tennis game from the early twentieth century. While there is increasing differentiation between ping pong and table tennis, many players and organizations consider ping pong to be just the less competitive, household form of table tennis. 1) Is there a difference or is it branding? There is much debate regarding the differentiation of table tennis and ping pong. Today, there are a large number of organizations and players that do not believe table tennis and ping pong are actually different sports. However, Olympic and championship players do discuss table tennis and ping pong as slightly different sports, so it seems that the divergence in rules is important. Historically, table tennis seems to be the original name for the sport, appearing at least as early as 1887. Ping pong was actually a nickname of the sport that was trademarked by several companies. When the name ping pong became difficult to use for legal reasons, table tennis was chosen as the official name of the sport. So there was no true difference between the sports originally other than branding, but today they are evolving into closely related but different sports. Paddle: In table tennis, paddles can come in a variety of designs with different blades and surfaces to allow for spinning the ball. Spinning is hard on the paddle and they need to be replaced regularly. However, ping pong is standardized to one type of paddle, a sandpaper paddle. These paddles typically last much longer than table tennis paddles. Ball: While many players use the same type of ball regardless of the sport, ping pong balls can be slightly larger in diameter than table tennis balls – 3.7mm and 3.4mm in diameter respectively. Table Tennis: Many table tennis players distinguish the two sports by the “spin” used in table tennis. Instead of hitting the ball, players will spin it in a variety of ways that is designed to make their hits harder to predict. Players also depend on their footwork to help them reach and spin properly. Ping pong: Ping pong is not traditionally known for spinning the ball, but simply hitting it. Ping pong uses a sandpaper paddle that is not designed to spin a ball, and many players don’t use footwork as much as table tennis players do, relying instead on hand-eye coordination. Table Tennis: In table tennis, a player should always serve by throwing the ball at least six inches out and above from the palm, and then hitting from behind the line. Ping Pong: Ping pong does not have hard-and-fast rules on serving. Some players serve according to table tennis rules, while others drop the ball and hit. Some players will even let the ball bounce once before serving it. Table Tennis: In table tennis, matches usually end at 11 points, and players are given two serves before switching servers. Ping pong: Ping pong matches can use either an 11-point format or a 21-point format, but they often run to 21 points. This makes ping pong games have longer rallies than table tennis games. In 21-point games, players are usually given 5 serves each that alternate. Table Tennis: Table tennis can be highly competitive, and technically reaches a higher level of competition than ping pong, as table tennis is an Olympic sport. There are also leagues and championships below the championship level. While table tennis can be played by anyone, some players call the competitive sport table tennis and the hobby sport ping pong. Ping Pong: Like table tennis, ping pong has national and global championships and leagues for serious players. However, it is not recognized as an Olympic sport. Many people refer to all recreational or hobby players of table tennis and ping pong as ping pong players, regardless of what rules they follow. Because ping pong has had a less formal history than table tennis, its rules tend to be less strict and variant forms of ping pong have emerged, like ping pong for teams. Table tennis and ping pong were originally the same sport, but ping pong was trademarked around the 1920s, making table tennis the common name for the sport. Many people still consider table tennis and ping pong to be the same sport, but the most competitive players often make distinctions between the rules of the two games. 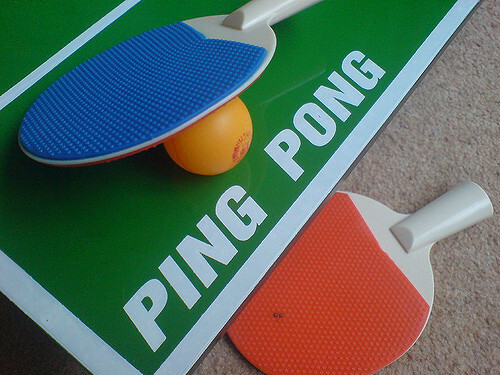 Table tennis uses a variety of paddles to spin the ball, and players depend on their footwork. In ping pong, only sandpaper paddles are used, and players use their hands instead of their feet to play. Table tennis can only be served one way, and matches are almost always 11 points. Ping pong allows for various serves and matches are usually 11 or 21 points, but the rules are flexible. People who differentiate table tennis and ping pong often say that table tennis is the competitive sport and ping pong is the hobby sport. Kelsey Robarts. 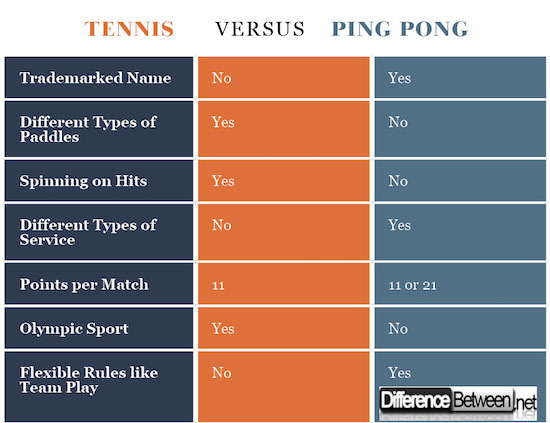 "Differences between Table Tennis and Ping Pong ." DifferenceBetween.net. March 6, 2018 < http://www.differencebetween.net/miscellaneous/sports-miscellaneous/differences-between-table-tennis-and-ping-pong/ >. Josh Dean. “Olympics 2012: Table Tennis vs. Ping-Pong.” Rolling Stone. July 27, 2012. https://www.rollingstone.com/culture/news/olympics-2012-table-tennis-vs-ping-pong-20120727. EmRatThich. “Difference Between Table Tennis vs. Ping Pong.” PingSunday. November 2, 2017. https://pingsunday.com/difference-table-tennis-vs-ping-pong/. Hema R. “What is the difference between Ping Pong and Table Tennis?” Sports Flu. September 3, 2017. https://www.sportsflu.com/table-tennis/pingpongandtabletennis/.